Not that it is at all important for things to be ‘new’ but mobiles are nothing of the sort. 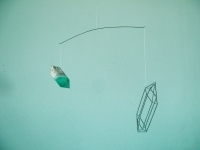 We created these mobiles in conjunction with Stuart Boyd playing with a very simple idea about balance and how a solid thing can have the same weight as something that is much larger but hollow. 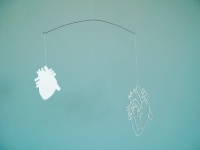 These mobiles are in perpetual motion, responding to something as energy slight as someone’s breath. They are incredibly responsive, made with so little material that it sometimes feels as if they barely exist.